Your business law attorney is responsible for giving you legal advice in different stages and aspects of your business. Overall, he helps ensure that your business does not violate any local or international business law. To protect the interest of your company, be sure to work with a business lawyer who can give you advice and take care of all your legal files, starting from the formation of your business to its dissolution. The basic responsibilities of your business lawyer include handling lawsuits, writing and reviewing contracts, creating staff manuals, as well as enforcing business guidelines and policies. 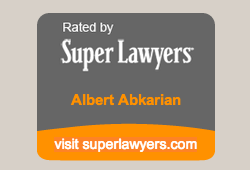 At Albert Abkarian & Associates, you get the benefit of focused attention on your cases, especially because business law is one of our main areas of practice. We have all the resources of a top national law firm while maintaining close relations with our clients, providing you with personalized attention every step of the way. Our Business Law department is focused on remedying business disputes and handling complex litigation matters. We are experienced in arbitration and mediation as well as trials of a wide range of business cases. Contact us today for more information about the types of cases we handle and the services we offer.